FREE DELIVERY on all orders over £200.00 except for customers ordering Safety Backed Glass products. Please call us for further information on our specialist carriage charge for these items. Please note: free delivery does not include Northern Ireland. Aspect Safety Mirrors operates a team of specialist installers and provides a comprehensive nationwide fitting service for studio and gym mirrors. Our mirrors can be installed in one day allowing for minimal disruption and disturbance. For larger installation projects we provide a free design service and site survey. Choosing the right product for the right application is paramount. 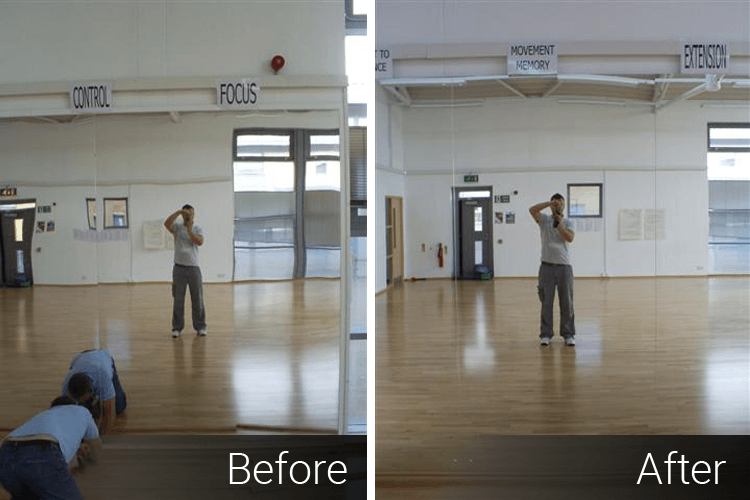 The above image shows a dance studio wall which had been previously installed with Acrylic Mirror panels, which was the wrong product choice for the intended application. Note the image distortion on the panels. Aspect Safety Mirrors carried out a replacement installation removing the existing Acrylic panels and replacing with new Pilkington Safety Backed Glass Mirror panels. It is vitally important that the correct safety mirror product is specified from the outset. Please call us with your requirements.